You still have time to warm up down in the West Indies at the Antigua Charter Yacht Show through this Saturday, December 11th. If you miss the show, we're sure you'll probably still enjoy the beach. 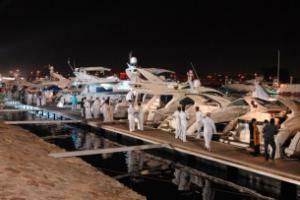 The Saudi International Boat Show (picture above is from last year's show) doesn't actually have boats in the sand. In fact, in addition to all the deserts, the kingdom also has its fair share of coastline, including 1,640 miles along the Red Sea (according to our friends at Wikipedia). Anyway, there are sure to be some super mega yachts at the show, which is going on now through Saturday at Al Furusya Marina & Yacht Club in Jeddah. Prefer the cold? We've got that. You may enjoy the Syracuse Ice Fishing Show, this Friday through Sunday, at the Oncenter Convention Center in upstate NY. We heard Paris got buried with an unusual amount of snow this week, but you can still have warm thoughts at a boat show. The Nautic Paris Boat Show is happening through this Sunday, December 12, 2010. As usual, the best way to find out if there is a boat parade happening near you is to do a google search for the phrase "Boat Parade" along with the name of your city, or call your local marina. More information about these events and more can be found in our boat show calendar.